A French composer born in 1969 at Bordeaux. After studying music at the regional conservatories of Bordeaux and Toulouse, Benjamin de La Fuente was a pupil of Gérard Grisey for composition and of Alain Savouret for improvisation at the Paris Conservatory from 1994 to 1999 and has followed the composition cursus at Ircam (1998-1999). He has devoted the greater part of his output to mixed music, with notably Redbone (1997), Cassure d'âme (2000), Noir/Écorce (2005), Play the Game (2006), Outside/Virage (2009). He composes acousmatic music (Le vertige du papillon I, 2003), but also purely acoustic works, such as Prima di tutto all interno del legno (2003) and “Go Ahead” (2007). 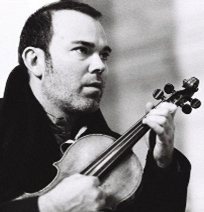 The cofounder of the Sphota Company (2000) and of the Caravaggio Group (2001), he leads a parallel career as an improviser on the violin. In residence at the Villa Medici in 2001-2002, he won the André Caplet Prize of the Académie des Beaux-arts in 2009.